Audrey is a psychopath and a serial killer residing in a small town in rural New Zealand. Audrey’s three estranged sisters arrive at Tiromoana for their brother’s funeral stirring up a dark family history of murder and deceit. As Audrey attempts to keep the past from destroying their futures, Detective Constable Higgins suspicions cause her to cover her tracks with deadly and dastardly results. This was an interesting, surprising, unusual read. The fourth book in Mateer's series centred on Audrey, a female serial killer living as a bed and breakfast host in scenic Northland, New Zealand, Murder in the Family, is told in terse prose with a tendency to veer melodramatic or a little cheesy. There's a sense of fun, of not taking itself too seriously. Audrey lives life on her own terms, while sometimes ending the lives of those who cross her or get in her way. But she's not a super-evil serial killer, more a lovable psycho. I'd read an earlier instalment of the series, and found this one to be better-crafted. Mateer seems to be hitting her stride with her series. It's almost like a bit of a guilty pleasure, as I found myself enjoying the tale more and more as it went on, and being less bothered by the slightly cheesy writing style as it went on. 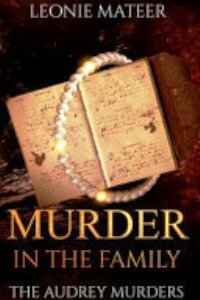 Murder in the Family is pretty well plotted, with plenty of action and a variety of interesting things happening to keep the pages turning. There are some beguiling characters populating this story, as Audrey's family gathers together - an unusual event in itself. We get more insight into some of what perhaps made Audrey how she is, and can see her in a more sympathetic light. The family relations provide plenty of great fodder. Overall, Mateer manages to bring everything together pretty well, even when at times she seems to have rather backed herself (or her story and characters) into a corner. There's excitement and a sense of fun. I surprised myself by how much I enjoyed the read, even though it isn't my usual style of crime novel I enjoy. One on the lighter end of the crime spectrum, despite some dastardly deeds.